...we need not! Lauren Dutton-Breen (our VBGB aka Vibrant Beet Guest Blogger) is back with some yummy eats for this season of celebration! Read on... Seasons Greetings Vibrant Beeters! Get your greens in the holiday spirit with this very simple, very healthy recipe for a Warm Brussels, Kale, and Bourbon Salad! Packed with vitamins and essential minerals, Brussels sprouts and kale are both members of the brassica oleracea family, which are a source of indole-3-carbinol, a chemical being studied for how it affects DNA repair in cells and appears to block the growth of cancer cells in vitro. It’s also crunchy and delicious, takes less than 10 minutes to make, and has bourbon in it. Cheers to health and happiness! Heat olive oil in large skillet over medium high heat. Add Brussels sprouts, sauté 3 minutes. 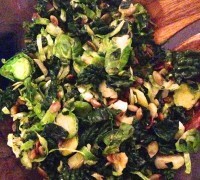 Add kale and mix with sprouts until everything is coated with oil. Add bourbon, pepitas, and salt. Mix well and cook another minute or 2 until some sprouts just start to brown. Serve immediately and enjoy! Feb 10 Beat the cold with this Lentil & Beet Leaf Soup! Dec 6 Brussels to the Sprouts!